I'm posting the MomsRising email on the Imus debacle because this is a crucial moment in our culture. When we heard about Don Imus' racist and sexist remarks against the Rutgers University women's basketball players, our mama hackles were raised. We want to raise our children with media that's intelligent and sane, not pandering to the lowest common denominator. Imus' comments were just plain wrong and unacceptable. As mothers of all colors, we need to call him out on that, for our children's sake and our own. One fundamental lesson we want to instill in our children is respect for every person's humanity. The media is so influential in creating culture. 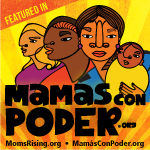 Let's make sure that the media knows where moms and all caregivers stand--no more trash talk! Imagine for a minute that your child had a dream and she spent her entire life working to achieve, working really hard and making everyone so proud, and then, when her dream was within her grasp, a big guy with a radio show and an audience of millions, called her out saying she was a "nappy-headed ho." PASS IT ON: Tell your friends about this petition by forwarding this email. Help send a loud and clear message to Imus' employers, advertisers, and guests. The more people that sign on, the more impact we'll have when we deliver the petition to MSNBC and CBS Radio. We want to raise our children with media that's intelligent and sane, not pandering to the lowest common denominator. Let's make sure that the media knows where moms, dads, grandparents, aunts, uncles and all caregivers stand. 1. We believe in media sanity, not censorship. 2. We believe that media has truly become "the other parent" in our kids' lives powerfully affecting their mental, physical, and social development. 3. We believe in teaching our kids to be savvy media interpreters—we can't cover their eyes but we can teach them to see. 4. We believe parents should have a choice and a voice about the media our kids consume. Every family is different, but all need information. 5. We believe that the price for a free and open media is a bit of extra homework for families. Parents need to know before they go. 6. We believe that through informed decision making, we can improve the media landscape one decision at a time. 7. We believe appropriate regulations about right time, right place, right manner exist. They just need to be upheld by our elected and appointed leaders. 8. We believe in age-appropriate media and that the media industry needs to act responsibly as it creates and markets media age-appropriate contents. 9. We believe there should be one, independent and transparent universal rating system for all media. 10. We believe in diversity of programming and media ownership.